*Was baptized but has not celebrated the Sacraments of Confirmation and/or Eucharist? PRE-CATECHUMENATE: A period of inquiry about the Catholic faith. CATECHUMENATE: A period of study of the faith/creed. ILLUMINATION PERIOD: Spiritual and scriptural preparation stage. 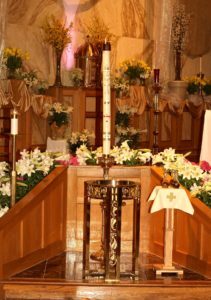 BAPTISM AND RECEPTION: At the Easter Vigil. MYSTAGOGIA: A time of continued study. CATHOLICS CAN ALWAYS COME HOME!